A brand new collection of remarkable travel tales from 'Silver Travelers'. 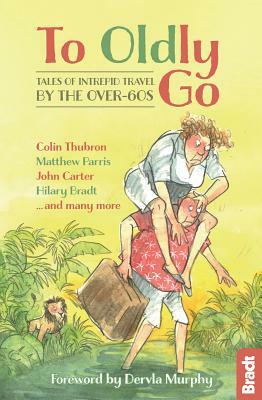 Dervla Murphy traveling in Havana at the age of 74, Matthew Parris swimming the Thames at 60, and Colin Thubron climbing the last stronghold of the Assassins in his 60s are among the writers recounting their adventures, often defying expectations - and the odds - and going outside their comfort zone to take a less-traveled path in later life. Published with participation from the Silver Travel Advisor, this single volume brings together contributions - some original, some previously published - from independent-minded souls whose experiences have been entertaining, amusing, thrilling, and even a little irresponsible. Other contributors include Roger Bray, 'Green Goddess' Diana Moran and our very own Hilary Bradt. Jennifer Barclay is a writer and editor, specializing in adventurous travel stories. She co-edited the travel anthologies AWOL: Tales for Travel-Inspired Minds (Vintage Canada) and The Irresponsible Traveler: Tales of Scrapes and Narrow Escapes (Bradt). She is the author of two travel memoirs, Falling in Honey: Life and Love on a Greek Island (Summersdale UK, Sourcebooks US; translated into Polish, Bulgarian and Latvian) and previously Meeting Mr Kim: How I Went to Korea and Learned to Love Kimchi (Summersdale UK, Wakefield ANZ). She has also compiled the gift books A Literary Feast, The Traveler's Friend and The Walker's Friend (Summersdale). She writes articles for newspapers and magazines and has appeared on national radio and TV. Since 2011 she has called the tiny Greek island of Tilos home. Colin Thubron is an award-winning master of travel writing and novelist. His first books were about the Middle East - Damascus, Lebanon and Cyprus. In 1982 he traveled in the Soviet Union, pursued by the KGB. These early experiences were followed by his best-known travel books: on China, Central Asia and Siberia, including Shadow of the Silk Road. He lives in London. Diana Moran is an all-round television and radio personality known as the 'Green Goddess' and part of the original team who in February 1983 launched BBC Breakfast TV. Her successful career as fitness guru, author and broadcaster specializing in well-being, health and aging issues has spanned four decades. She is an experienced and humorous motivational speaker. Having traveled the globe for over fifty years, writing and broadcasting about his journeys, John Carter is retired. Or, rather, he continues to travel and write, but for pleasure not profit. He is currently compiling an anthology of 'traveler's tales'--all true, mostly unbelievable--and working on a documentary project for BBC Radio. Dervla Murphy was 74 when she undertook this journey. Now in her eighties, she continues to travel the world and is passionate about politics, conservation, bicycling and beer. Her first book, Full Tilt: Ireland to India with a Bicycle, was published in 1965 and she has won worldwide praise for over twenty books since. Brian Jackman is a freelance journalist and author with a lifelong passion for travel and wildlife. Today his work appears mostly in The Daily Telegraph and Travel Africa. Best known as Britain's foremost writer on African wildlife safaris, his African books include The Marsh Lions (with Jonathan Scott) and most recently Savannah Diaries. Matthew Parris worked for the Foreign Office and the Conservative Research Department before serving as MP for West Derbyshire. He now writes as a columnist and occasional travel writer for The Times, broadcasts for radio and television and is the author of Inca Kola, recounting his backpacking adventures in Peru. Roger Bray has been writing about travel for over 40 years. A former travel editor of London's Evening Standard and frequent broadcaster, he is the joint author of Flight to the Sun, a definitive history of the post war tourism boom and has won a number of awards for his writing.